You’ve worked extensively and very successfully in horror, and now in superhero genres. What is it about those two worlds that you love? You know, with both of them, it’s just about great storytelling, so it’s finding stories that you want to tell. With the Conjuring universe, particularly with Ed and Lorraine Warren, we found some great characters to really anchor each of the stories. And in the superhero universe, obviously we found with Arthur Curry in Aquaman a great character to anchor it, plus his whole family dynamic, and with SHAZAM! we found the same thing with Billy Batson — he’s a great character to anchor a story, to tell a hero’s journey. And with SHAZAM! we get to tell a true origin story, which is always a lot of fun. What makes for a great superhero origin story? You have to care about the character. You have to have a character who feels at a crossroads in life in some way, or certainly a dissatisfaction with life. With Aquaman, you had a character who never felt like he belonged anywhere. Billy Batson is in many ways the same; he feels that his life will not be complete until he finds his birth mother. He believes that blood, a family connection, is the most essential thing that he is missing. And so, he’s a pretty dissatisfied guy when we meet him as a 14-year-old in Philadelphia at the beginning of our story. That’s a great starting point for an origin story. And we get to follow him through his journey to ultimately discover what’s truly important in life: that a bond is more important than blood when it comes to what makes a family. So, from Billy to Shazam, what is it about Shazam in particular that makes him a compelling Super Hero? 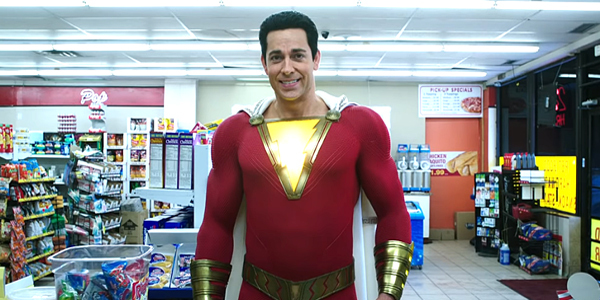 He’s very different than a lot of the other superheroes that are out there, frankly than any of the other superheroes out there, and I think that that’s one thing that’s really going to set SHAZAM! apart from the other superhero movies that have come down the pipeline over the course of the last decade. He is a kid in a superhero’s body. It’s the ultimate wish fulfilment movie. And it’s extraordinarily funny. Everybody can relate to the idea of what would you do if today you were suddenly a superhero? How would you respond to that? And the answer to that question is very different when you’re a 14-year-old boy than when you’re already an adult. And he’s dealing with the element of magic, correct? It is one of the things that we love about Shazam, that unlike most superheroes he hasn’t inherited his powers, and they’re not encrypted within his DNA. He’s not an alien. He’s just a regular kid who, through a powerful wizard and a little bit of magic, gets the ability to become an adult Super Hero. I think that really distinguishes Shazam from any of the other superheroes in the genre. Would you also say he has a sense of joy about him that kids have, and doesn’t fall immediately into having that sense of responsibility that the adult heroes do? That’s exactly right. I think that in many ways Wonder Woman was a great step in the right direction for DC, Aquaman was a big step forward on that path, and now I feel like SHAZAM! is the natural progression. It feels different than any other superhero movie out there. It’s action-packed, but also has a tremendous sense of fun to it, and it’s really funny. What was it about David F. Sandberg’s take on the character and the story that made him the right person to direct this movie? First of all, David is a very complete filmmaker. I’ve said before that he is very much the spiritual successor to James Wan, and both of them came through horror into the DC universe. I think that David brings to the table those same qualities of being a total filmmaker, that he really understands, in a wholistic fashion, everything about putting a movie together and making it right and rooting it in character, not in spectacle; he knows that the spectacle will come, but you have to root it in character. So, his take on SHAZAM! was very much from the perspective of Billy Batson, and asking himself what do you do if you’re a 14-year-old boy who’s really unsure what life is going to bring him, who is certainly very unhappy in his current situation, and suddenly becomes a superhero? I think David had a real clarity of vision in terms of what he wanted to do with this, how he wanted to tell Billy’s story, and how he ultimately wanted to connect Billy with his foster siblings in a way that truly could bring good to the world. What about Zachary Levi, what makes him the perfect Shazam? When we came to cast the movie, we knew that we needed an adult who felt like a kid—a kid trapped in an adult’s body. And there really is no one other than Zachary Levi who could do what Zac has done in the film. Zac is in every regard a 14-year-old in a very handsome, very physically strong man’s body. He’s super fun, incredibly funny, very irreverent. He’s a big gamer. He loves comic books. He just really was the perfect guy to play Shazam and, in many ways, Zac is such a fanboy himself that he brings an authenticity to the character. He brings what he, as a fan, would want this character to be. Do you think he understands the audience for this character in a way that not every actor naturally does? Absolutely. I mean, he naturally gravitates towards the people that are going to enjoy these films, so he has a barometer of what is going to make this fun and unique and different, and refuses to let it slip into anything else. He also has a youthful idealism that has never diminished, something he brings to all of his roles but also just conveys naturally as a human being. He’s not a jaded individual in any way, and he’s managed to retain that special quality and that glimmer of fun in his eye, that glint of excitement at getting to do what he gets to do, which in this film is play a superhero. What is special about the foster family in this movie and why is that where Billy finally finds somewhere to fit in? It’s one of the things that I love most about this movie, the message that it doesn’t matter who you are, what you look like, what colour you are, what your physical attributes are… There is a superhero within each of us, and it’s just about trying to figure out how to bring that to the forefront. I love Billy’s relationship with his foster siblings. I like the way that they embrace him. I like the way that they understand that maybe it’s going to take a beat before he embraces them back, but they never give up on him. They’re a supportive group, and though they all come from different biological parents, they’ve created a family with Rosa and Victor. And this is a real family. It doesn’t matter that they’re not connected by blood. They’re connected by bond, and that ultimately is stronger than anything. I love that message in the movie. What makes Freddy the ultimate sidekick? Freddy happens to be a superhero fanatic and he’s got a tremendous knowledge base. So, who better to go to when you suddenly become a superhero, but have zero knowledge of what superheroes do, how they behave, how they respond, or how to handle the situation? As Shazam, Billy quickly finds in Freddy a confidant who he can open up to about his insecurities and his uncertainties, and Freddy is there to help him navigate this path. Would you say that by being Shazam, Billy finds his way to a friend? Very much so. It’s much easier for Billy as Shazam to connect with Freddy than it was for Billy as Billy to connect with Freddy. They didn’t have that common bond when it was just Billy and Freddy. But once he became Shazam, a Super Hero, the thing that Freddy knows the most about, there was a very natural connection. And through that connection the rest of their relationship flourishes, they find other points of contact. But those points of contact would never have been discovered had it just been Billy the teenager and Freddy the teenager. What do you want audiences to experience when they see SHAZAM!? This movie is a super fun action comedy with tremendous heart at its centre, that’s also grounded in reality, because it’s set in a real city, Philadelphia. It’s got a lot of the elements audiences responded to so positively in Aquaman, and I think if they enjoyed that, they will have a lot of fun with SHAZAM!